Happy Saturday and welcome to Whimsie Doodle's March Challenge - Seeing Spots! This month, we want to see polka dot papers, circle diecuts, buttons - anything round! 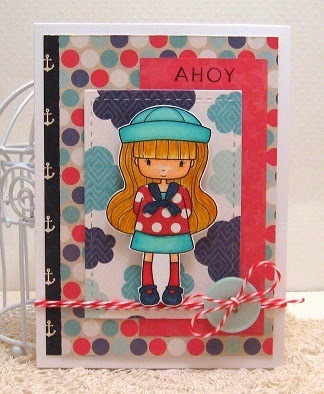 For this challenge, I used one of our newly released images - "Ahoy Lizzie" which can be found here. For February we will once again have two (2) lucky winners for this challenge! One (1) winner will be drawn at random to win a FREE Whimsie Doodles image of their choice from our latest release. And the second winner will join our team as a Guest Artist in April 2014!! Make sure to check out the Monthly Challenge Details page for all the rules and specifics. You have until April 13th to complete and link up your entry.